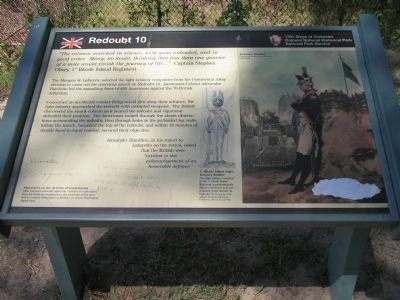 The Marquis de Lafayette selected the light infantry companies from his Continental Army division to carry out the American attack on Redoubt 10. Lieutenant-Colonel Alexander Hamilton led the assaulting force of 400 Americans against the 70 British defenders. Concerned an accidental musket firing would give away their advance, the light infantry approached the redoubt with unloaded weapons. The British discovered the attack column as it neared the redoubt and vigorously defended their position. 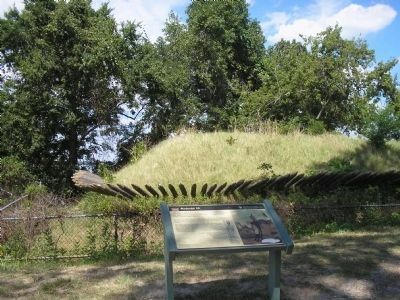 The Americans surged through the abatis obstructions surrounding the redoubt, then through holes in the palisaded log walls within the trench, breached the top of the redoubt, and within 10 minutes of mostly hand-to-hand combat, secured their objective. Erected by Colonial National Historical Park, National Park Service. Location. 37° 13.752′ N, 76° 29.852′ W. Marker is in Yorktown, Virginia, in York County. Marker can be reached from Ballard Street (Virginia Route 238), on the left when traveling south. Touch for map. Marker is located on the Yorktown Battlefield in Colonial National Historical Park, at stop D on the Battlefield Tour. Marker is in this post office area: Yorktown VA 23690, United States of America. Touch for directions. Other nearby markers. At least 8 other markers are within walking distance of this marker. Capture of Redoubt No. 10 (here, next to this marker); Redoubts 9 and 10 (about 400 feet away, measured in a direct line); Time, Tide and Erosion (about 400 feet away); The Second Siege Line (about 400 feet away); Grand American Battery (about 500 feet away); Redoubt 9 (about 600 feet away); French Soldiers and Sailors (about 600 feet away); Communicating Trench (approx. 0.2 miles away). Touch for a list and map of all markers in Yorktown. More about this marker. 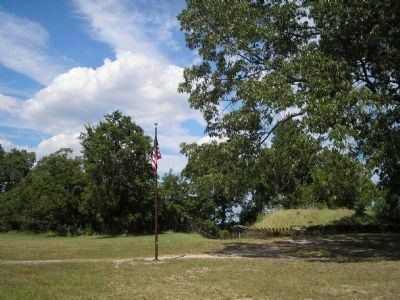 The right of the marker features a picture of Alexander Hamilton in the fortifications at Yorktown. He is next to a cannon and in front of a grouping of gabions. The picture is Courtesy of the Museum of the City of New York. On the night of October 14, 1781, while the French troops were attacking nearby Redount 9, Americans stormed this position. Both redoubts were taken in less than a half hour and were incorporated into the Second Allied Siege Line. More. Search the internet for Redoubt 10. Credits. This page was last revised on June 16, 2016. This page originally submitted on August 29, 2008, by Bill Coughlin of North Arlington, New Jersey. This page has been viewed 1,841 times since then and 85 times this year. Photos: 1, 2, 3. submitted on August 29, 2008, by Bill Coughlin of North Arlington, New Jersey.